Rabcat software has been at it again – and no, we're not referring to driving go-karts around the office! Renown for creating stunning games, the software developer has won accolades for the beauty of its games. 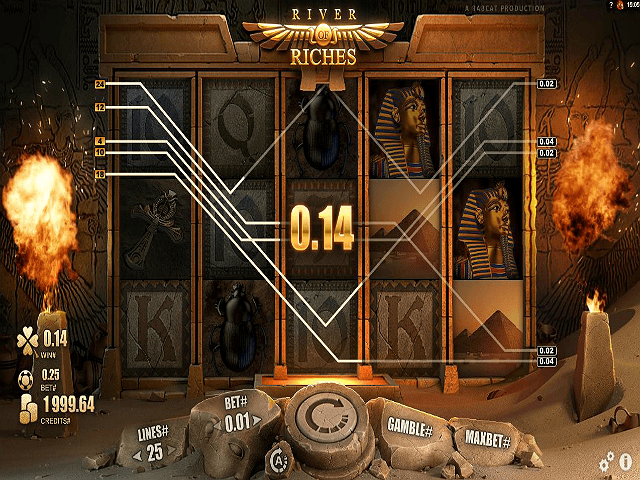 Their River of Riches online slot, an epic adventure through ancient Egypt, is no exception. 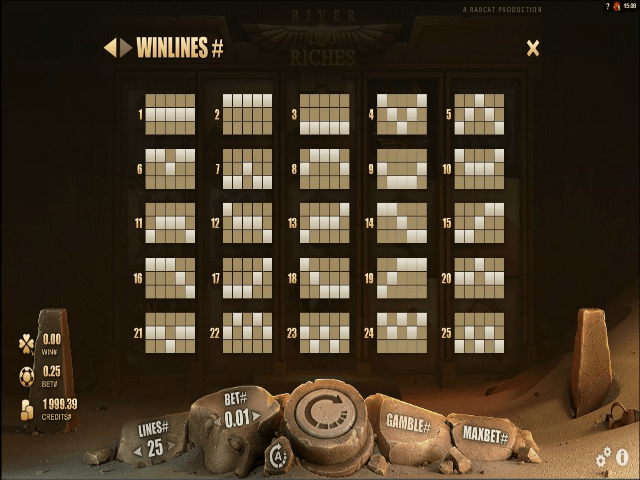 Rabcat state that River of Riches online slot has sophisticated mathematics designed to 'enhance gaming experience' built into its five reels and 25 paylines. Read our full slot review guide to find out whether the slot's veins are indeed laced with such riches. Play River of Riches for Real Money! 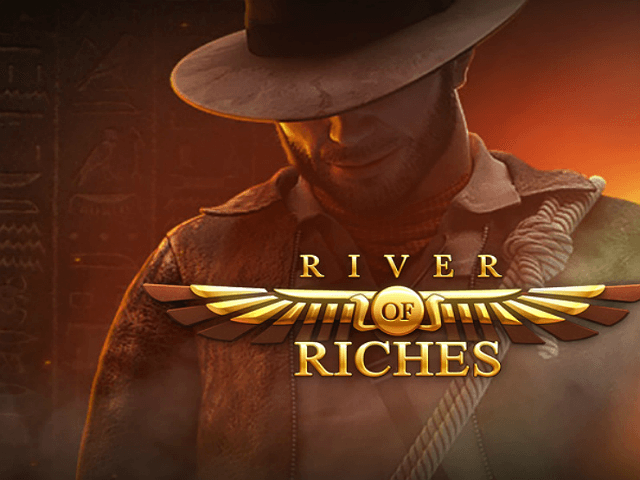 River of Riches slot was launched in May 2015 and is one of an array of games based around ancient Egypt – a hot gaming niche due to the 2017 release of the new Mummy film. Rabcat software's epic yarn takes you deep into the land that boasts opulently adorned Pharaohs, gilded tombs, and the Nile: a river laced with gold and blessings of fertility. However, less romance and more substance – this game looks amazing! The slotscape has a slick dusk skyline, with reels illuminated by golden symbols and beautifully animated icons. Think gold Ankh artefacts, Tutankhamun, Giza pyramids, stone carved Q, J, 10, K, black scarab beetles, scatter scarab logos, and the (Indiana Jones-esque) Wild explorer. Other elements that feel very 'Rabcat' include added suspense of slow-motion reels as a win approaches, and icons bursting to life on screen in celebration. 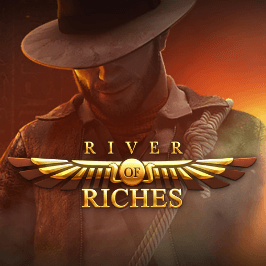 River of Riches online slot is a clean-cut offering that features base-game prizes, a wild icon, plus a free spin game with sticky wilds. A 96.6% return-to-gamer level ensures solid payback credentials. River of Riches is highly appealing if you have a modest bankroll. With a maximum spin stake of two pounds, it's refreshing to play a game where you don't need a massive budget to win the biggest jackpot. The payout structure is simple, too , with base game rewards plus free spin bonuses. In the base game, Tutankhamun symbols are worth the most, with payouts from four to 2000 on a two pound spin. Other symbols pay out at a variety of levels, ranging from four pounds to 1000 for five Ankh icons. Rabcat have kept things simple with the River of Riches slot bonus – there's just the one feature: the free spins Red Scarab idol bonus. 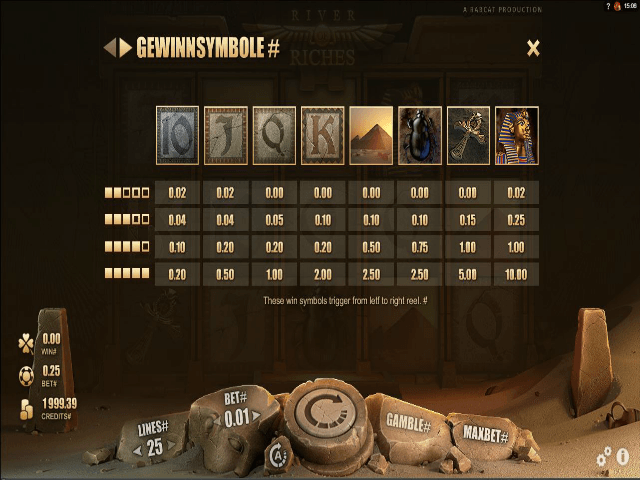 The symbol pays out on winning combo's from just two icons, while matching three or more triggers ten free spins with sticky wilds. You can win between 100 and 2500 for landing winning combinations with this symbol, based on the maximum bet of two pounds. Share this River of Riches Review today! If you like River of Riches, you'll love these slot titles too!